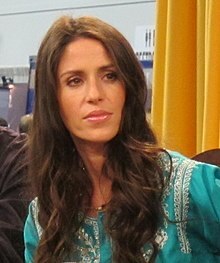 Soleil Moon Frye (born August 6, 1976) is an American television actress. Her best-known roles are that of Punky Brewster in the same-named sitcom which lasted from 1984 to 1988 and Roxie in the television sitcom Sabrina, the Teenage Witch (starting in 1996 and ending in 2003). Frye was also in other things on television. She began acting at age 6 on television. ↑ "Soleil Moon Frye". The Infoplease. Retrieved Jun 8, 2016. ↑ "Soleil Moon Frye". Famous Birthdays.com. Retrieved Jun 8, 2016. This page was last changed on 9 June 2016, at 10:14.